Among the energy efficiency strategies that are often suggested for reducing energy use in smaller commercial facilities are LED lighting, Variable Speed Drive compressors, Demand-Controlled Ventilation systems, and Energy Management Systems. 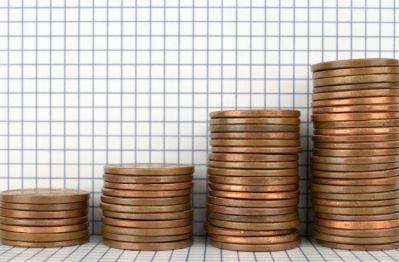 These systems require an initial cash outlay – albeit one that is often offset by a utility rebate – so it is logical to conclude that energy efficiency comes at a price. Said in other terms, energy efficiency is an expense. But is that really accurate? For these types of purchases, acquisition of the product itself is not the end goal; energy efficiency is the end goal (this is the corollary of the observation that no one buys energy for a facility because they want to own energy – they buy it because they need it to run their equipment). And, the goal of energy efficiency itself is to reduce the amount of energy required to accomplish a specific task – in turn reducing expenses (and increasing profits). Therefore, is commercial energy efficiency an expense – or is it really an investment? 1. cost or charge: the expense of a good meal. 2. a cause or occasion of spending: A car can be a great expense. 1. the investing of money or capital in order to gain profitable returns, as interest, income, or appreciation in value. By these definitions, energy efficiency sounds much more like an investment than an expense. And yet, too often the purchase of energy efficiency-related products gets compared with alternative uses of capital, without consideration of the return on that investment. This creates an apples-to-oranges comparison, which can block access to the ongoing savings that energy efficiency projects can create. So how do the experts see energy efficiency? McKinsey made a big splash with its Greenhouse Gas Abatement graph, first published in 2007. What instantly caught people’s attention was the fact that the energy efficiency options displayed actually showed a negative cost – indicating that rather than being an expense, energy efficiency actually delivered a direct return. 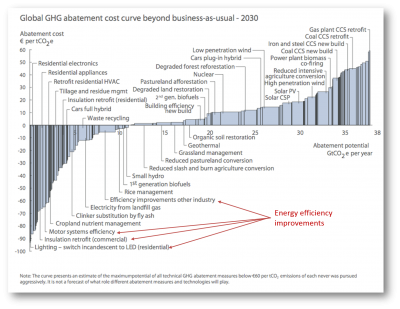 In other words, these energy efficiency options represented an investment. Another way to look at the question is presented by Energy Star with their CFO Calculator. The Cash Flow Opportunity Calculator, in their words, “helps inform strategic decisions about financing energy efficiency projects. Using the tool, you will be able to estimate how much new equipment you can finance using anticipated savings”. In other words, these energy efficiency projects create sufficient savings to pay for themselves – and the more invested, the greater the savings, and the greater the ability to purchase more equipment to increase the savings. The key take-away is that the full lifecycle impact of energy efficiency on the bottom line needs to be taken into consideration when looking at a commercial energy efficiency investment. In fact, energy operating costs in general should be considered. For example, purchasing a higher efficiency HVAC system for $30,000 with an annual operating cost of $10,000 is a much better investment than a system that sells for $25,000 but costs $12,000 per year to operate. And yet, too often, ongoing operating costs (and operational savings) do not enter the decision-making equation. Small commercial energy efficiency really is the gift that keeps on giving. Interested in learning more about energy efficiency in small commercial facilities?